Effie’s fascination with alternative medicine and health started at the age of five when she went with her grandmother to an acupuncturist in Tel-Aviv. She was intrigued by the needles and the burning moxa on top of them and spent the whole time asking both her and her doctor lots of questions (as kids do). At the age of 20, Effie Love travelled around India and found Yoga and Meditation. This had a profound and deep impact on her life. She studied Reiki and massage and during this time her interest in energy work grew. Although amazing she felt an element of depth was missing. This was when she started thinking of acupuncture again. Effie moved to England and enrolled on a degree level course at the International College of Oriental Medicine. The combination of bodywork, such as massage, with pure energy work, such as acupuncture, can bring outstanding results. In 2013 Effie spent three months running a multi-bed acupuncture clinic for the Dalai-Lama’s elder people home, which she found a very beautiful and humbling experience. 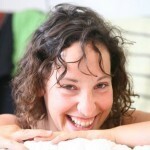 She has a keen interest in helping people maintain a healthy balance between modern living and wellbeing. 3 months intensive acupuncture training scholarship in Heilongjiang University, Harbin, China.